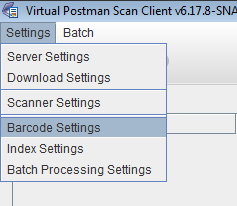 The barcode settings configure how the Virtual Postman Scan Client finds barcodes in scanned images. To access the barcode settings, select the Barcode settings option from the Scan Client's Settings menu. 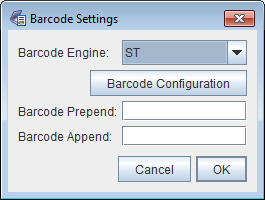 In Figure 3.12, “Barcode settings dialog” the barcode settings window is shown. The Virtual Postman Scan Client includes two different barcode recognition engines, ST and ZX. We recommend using the ST barcode recognition engine unless specifically advised otherwise. Using the Barcode Prepend and Barcode Append fields you can configure a standard prefix or suffix to be prepended or appended to barcodes found in scanned images. This can be used in situations where the barcode on the scanned document does not contain all the desired information to be stored in an index. For example, if a page has a barcode with a value of 12345, but you would like to record the value of ABC12345 in the index, you would set the Barcode Prepend field to ABC.